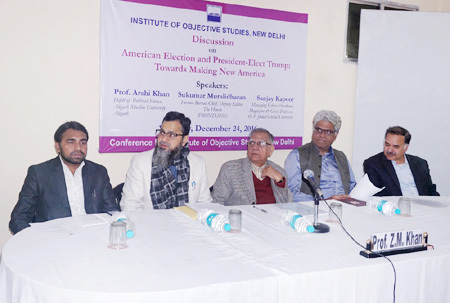 A discussion on “American Election and President-Elect Trump: Towards Making a New America” was organised by the Institute of Objective Studies at its conference room on December 24, 2016. 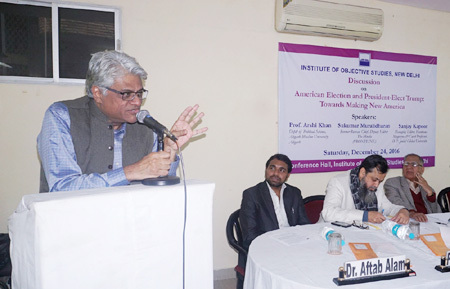 Sanjay Kapoor, managing editor, Hardnews Magazine and guest professor, O. P. Jindal Global University, who initiated the discussion, shared his experience during his stay in Iran around the time the results of the elections to the US presidency were being declared. He said that the public sentiment in Iran was against the nuclear deal signed by President Hasan Rouhani with US President Barack Obama. Victory of the Republican nominee Donald Trump as US President was bound to impact American foreign policy on West Asia. According to him, the US West Asia policy would be decided by the new regime as to how it dealt with Iran, whose growing influence, particularly in Syria and Afghanistan, would be watched by the United States with interest as Saudi Arabian and Russian involvement in Syrian strife would force it to reshape its policy on the Middle East. He said that of late, Egypt had some problem with Saudi Arabia resulting in the use of derogatory language against its ruler, Shah Salman. Similarly, Russia had a bit softened its stand on Israel and was on the verge of striking a deal with Saudi Arabia over oil. Referring to India’s relations with the US under the new dispensation, he noted that though there was no institutional support to the Republican Party from the Indians living in the US, a few people from the Indian diaspora did approach the Republican Party leaders to seek good offices with the government. Still there was confusion, he said. It was not yet clear how America under Trump would react to the construction of Chabahar sea port in Iran with Indian assistance. Chabahar port assumed importance as it emerged as main transit point in the region. It was also the main trading route for Afghanistan and India to Europe and Africa. India’s foreign secretary, S. Jaishankar also toured America to explore the possibilities of good relations with the new administration. He believed that India suffered a setback by not responding favourably to the Chinese offer of joining the China-Pakistan Economic Corridor. He said that confusion over India’s relations with the United States post-Trump victory persisted. Programme Manager, International Federation of Journalists and ex-bureau chief and deputy editor, The Hindu, Sukumar Muralidharan insisted that Trump had no political background. His was the case of post-truth society in the US as the right wing anger with the policies followed by President Reagan and Clinton led to strain on the country’s economy during Reagan administration. Coal and steel industry collapsed and business giants like IBM and Coca Cola emerged. As of now, the economy was neck-deep in debt. Taxation had become tough for the American people. He said that Trump’s foreign policy would be determined by his domestic policy. Explaining the post-truth, he said that Trump repeatedly spoke untruth. During the campaign, he talked of the things that would be impossible to achieve. Despite being unfit for the office of the president, he continued to gain. While the press used to be the voice of the establishment, it was the social media that worked in his favour; it grew by twenty times. The number of the followers on Face book and Twitter grew many more times. He observed that Trump blamed the minorities and the blacks for all the ills and tried to convince the electorate that he was aspiring for global hegemony. He appeared to invite massive confrontation with the world powers, including China. Compared to Donald Trump, Barack Obama was a conciliator and compromiser. He remarked that what Trump said militated against the political truth. This was the emergence of a post-truth society, he said. He believed that the conflict on Israel was in the offing. Prof. Arshi Khan, Deptt. of Pol. Sc., AMU, opined that with the victory of Trump, the theory of potentiality and actualism was unfolding-final stage of unfolding as far as Israel was concerned. Quoting President John F Kennedy, he said that Israel was very powerful in the US. In this connection, he especially referred to the book Bomb in the Basement written in 1999. This book disclosed that Israel was providing vital information to France against Egypt. The US foreign policy had always been Israel-centric. During the entire electioneering period, Trump convinced labourers and xenophobes that he would make United States greater again. Referring to the meeting of the America-Israel Public Affairs Committee (AIPAC) held on March 12, 2016, he said that Trump had told the meeting that he was a blind supporter of Israel. He said that Trump had also supported Israel attack on Gaza Strip in 2004. His policy on Iran would be catastrophic as he believed that it had terror cells on its territory accusing it of abetting terrorism. Trump also termed Palestinian fight for freedom as terrorism and pleaded that they be treated as terrorists. Trump had been heard saying that there would be no peace so long as Palestinians were treated as martyrs. He was also of the opinion that the world would be at peace so long as the US was found standing on the side of Israel, Prof. Khan said. At the AIPAC meeting, Trump had gone to the extent of saying that he would ensure that the capital of Israel was transferred from Tel Aviv to Jerusalem. Thus the bonds between the US and Israel were unbreakable. Prof. Khan noted that it was the core interest of the US that Israel was safe and secure. He foresaw total anarchy in West Asia following Donald Trump’s elevation as American president and the crisis in the region further precipitating. This fear stemmed from the fact that pro-Palestine world leaders like Gaddafi, Hosni Mubarak etc. were no longer alive to speak on behalf of the Palestinian people, he concluded. 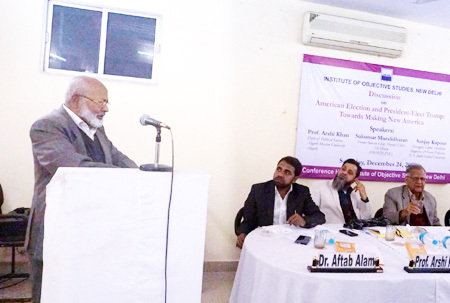 Chairman of the IOS Dr. Mohammad Manzoor Alam raised the question as to who created the ISIS and al Qaeda, and who was engaged in finishing them. He sought to know if there was any guarantee that the Central Intelligence Agency (CIA) of USA would not create another such organisation. He also wanted to know why the Daesh did not utter a single word against Israel. He stated that as part of its foreign policy, America first created such agencies and then cut at their roots. He said that consternation and frustration was gripping the Arab world after Trump’s election as US president. He lamented that the number of leaders espousing the cause of Palestine had dwindled in India with the exception of a few, like Mani Shankar Aiyer. He said the US foreign policy took a U-turn after Kennedy and now pro-Israeli elements controlled the CIA and the latter controlled the president. 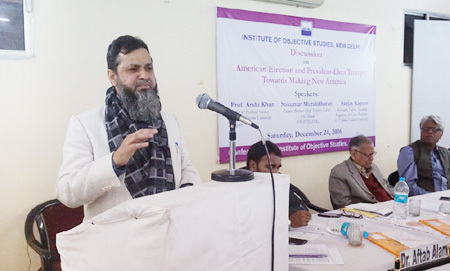 Presiding over the function, Secretary General, IOS, Prof. ZM Khan opined that new US president could not behave like a dictator of the Third World. American democracy evolved over the years through liberal democratic process. The president had his own limitations as he had to work within a system. He said that besides the president, there were other centres in the system that also operated. Yet, that should not cause unnecessary concern in the rest of the world. Earlier, the discussion got off to a start after the recitation of a verse from the holy Qur’an by Hafiz Athar Husain Nadvi. 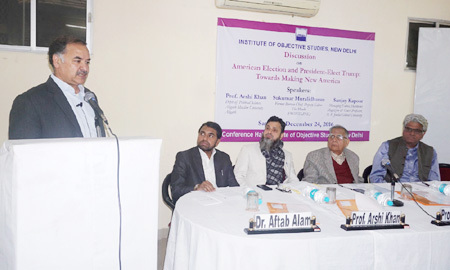 Dr. Aftab Alam, of Delhi University conducted the proceedings. 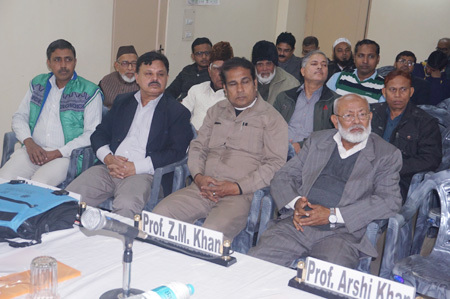 The notable attendees who were present on the occasion included Dr. Riyazuddin, Dr Tariq Ashraf, S Ahmadullah, Mazharul Haque Ansari, Shahabuddin Ansari, Syed Raza, Firoz Khan Ghazi, Dr. Md. Anzar Alam, Maulana A.R. Shaheen Qasmi, Md. Tauheed Alam, Md. Sohrab, Md. Ehtesham Akhtar, Changez Khan, Advocate, Md. Mubarak Ali, Tabassum Rasool, Ibrahim Alam, Safi Akhtar and Waseem Fahmi, besides several university teachers, social activists and prominent citizens.